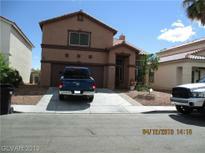 Below you can view all the homes for sale in the Northbrook subdivision located in North Las Vegas Nevada. Listings in Northbrook are updated daily from data we receive from the Las Vegas multiple listing service. To learn more about any of these homes or to receive custom notifications when a new property is listed for sale in Northbrook, give us a call at 702-323-5963. Lovely, large, well maintained home*4 bedrooms upstairs*Kitchen has granite countertops and large island*Kitchen and dining area lead to backyard with inviting above ground pool*Large living room with vaulted ceiling*Family room or formal dining room off kitchen*Master bedroom has walk-in closet and vaulted ceiling*Ceiling fans in three bedrooms*upstairs bathrooms have dual sinks*Window coverings throughout*No carpet in entire home*Must see home* MLS#2087811. Shamrock Real Estate Svcs.